Each season I make it a priority to check in on Phillies Alumni weekend. I love seeing the players from my younger years come back to Philadelphia, even if it is to just wave to the crowd. When a club is going to lead the league in losses you look for bright spots anywhere they can be found. The 2016 Phillies schedule came out earlier this week and it appears the weekend will occur August 12th &13th versus the Rockies. 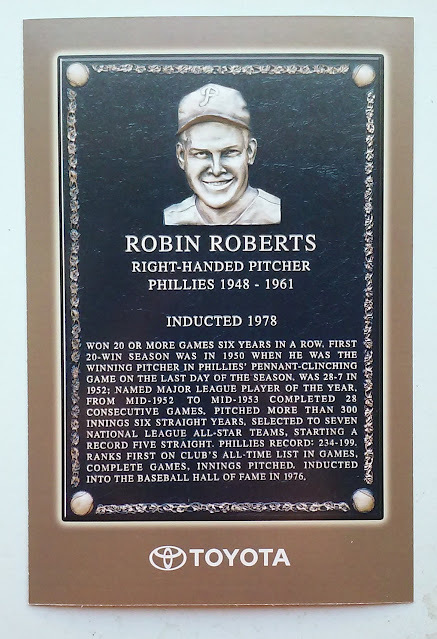 Each year the Phillies add an alum to their Wall of Fame, the initial induction was of Robin Roberts in 1978. 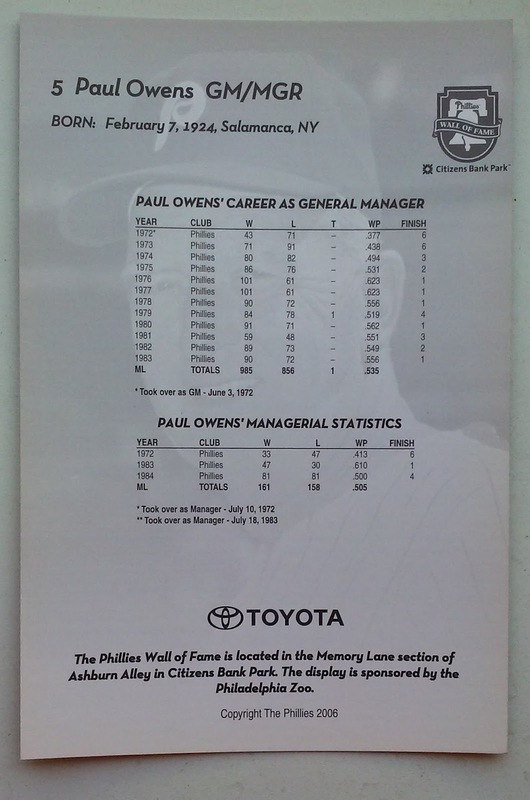 In 2006 the Phillies issued a set of postcards to honor the "Wallers". 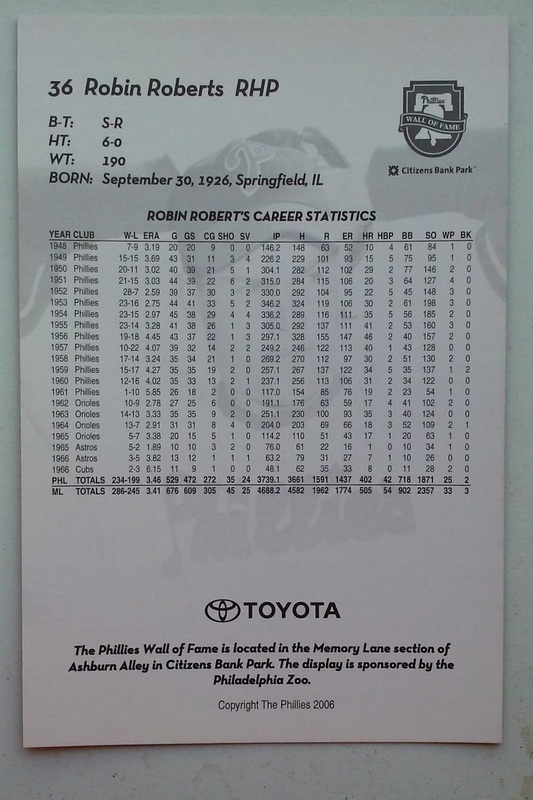 Today we have the card dedicated to Roberts. 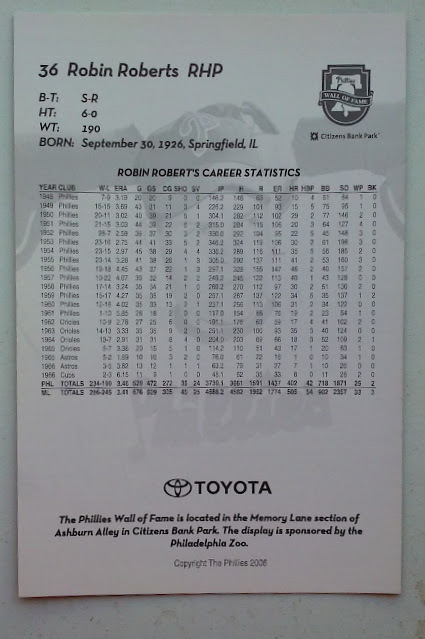 Robin Roberts Stats on the back plus a ghosted faux-action shot. 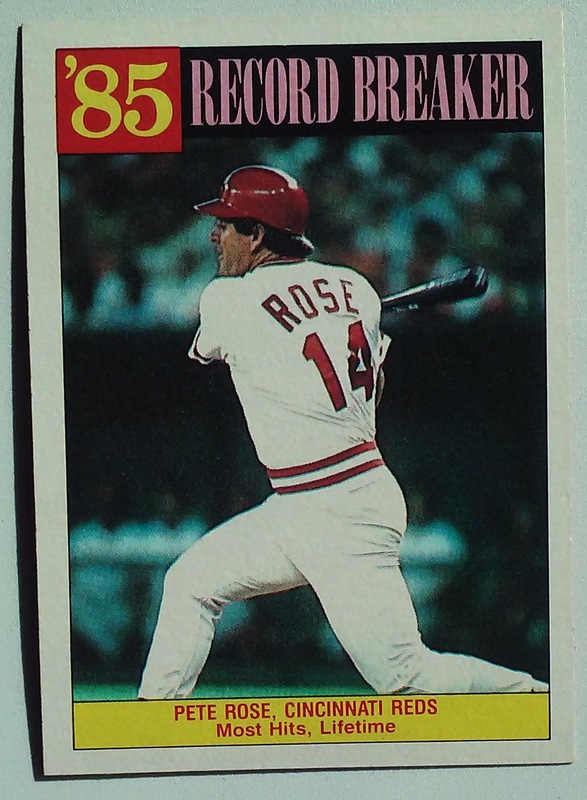 Topps noted the accomplishment with card #6 in their 1976 Record Breaker Set. Rennie is one of only two players to pick up 7 hits in a nine inning game, the other is Hall of Fame manager Wilbert Robinson. Interesting graphic on the RB card. All of Stennet's ABs are listed along with his scoring result. Notice he had not one but TWO multi-hit innings, the first and the 8th. Stennet's 7 hits got him the first 3 hits of a cycle. 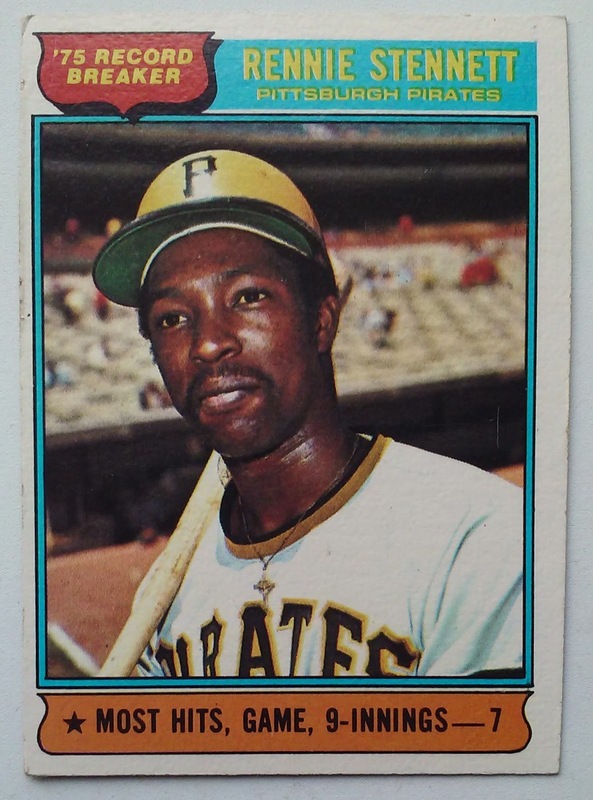 He scored five of the 7 times he reached - Rookie Willie Randolph pinch ran for Stennett in the 8th. The first and last hits were off of different Reuschel brothers, Starter Rick first and Finisher Paul Last. 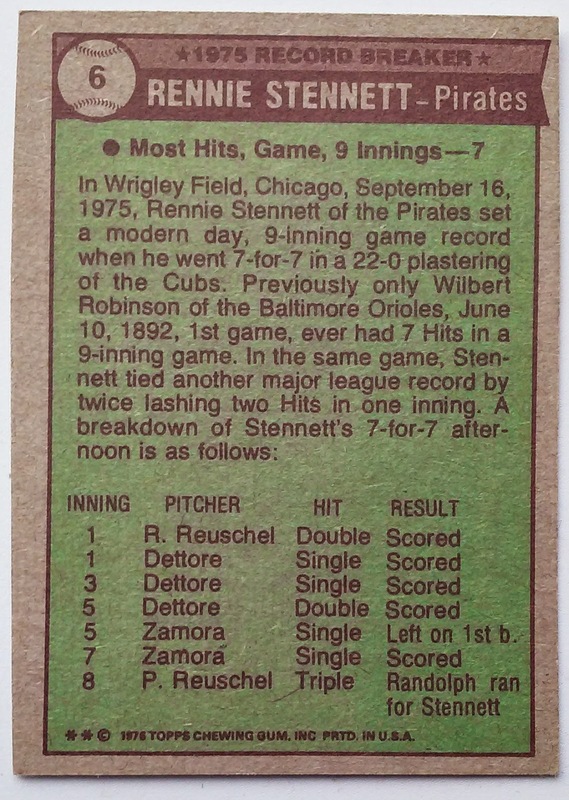 As a team the Pirates collected 24 hits that day. Every starter including pitcher John Candelaria picked up a hit AND scored a run. In addition to Stennett six other Pirates had multi-hit games. Not sure what all the excitement is about, Paul "The Pope" Ownes spent close to 50 years working for the Phillies in some capacity. 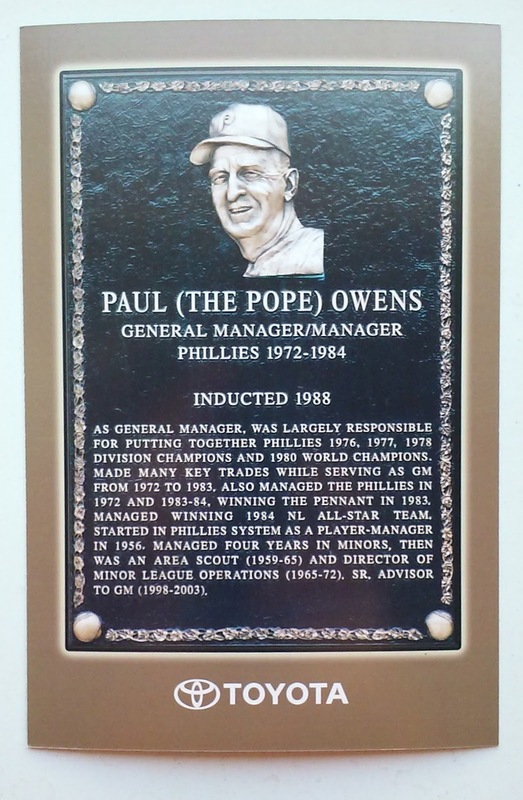 I think Owens got his nickname from having a resemblance to Pope Paul VI. I am not Catholic, but I do think of Paul VI as my Pope - he was Pope during my entire childhood. It is hard to make out a resemblance in the image of the plaque of Owens featured above, but one may see it in a card we feature below. To me Paul Owens will always be the guy who took the reigns from Pat Corrales and led the 1983 Phillies to the NL Pennant. Two years ago we marked the 30th anniversary of that team with a series on a few of the notable players from the squad including Owens. The ghosted photo on the back of the postcard doesn't give us much help with a Pope Paul VI connection, but there is something interesting in the stats. I can't recall many cards that have a persons Win-Loss record as a GM - but there it is. 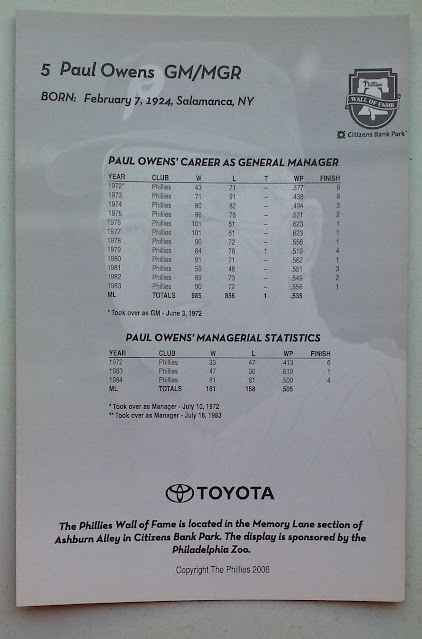 Here we have an image of Owens from an angle similar to the one used for the WoF plaque. I suppose he looks Popish - with a baseball cap and windbreaker. 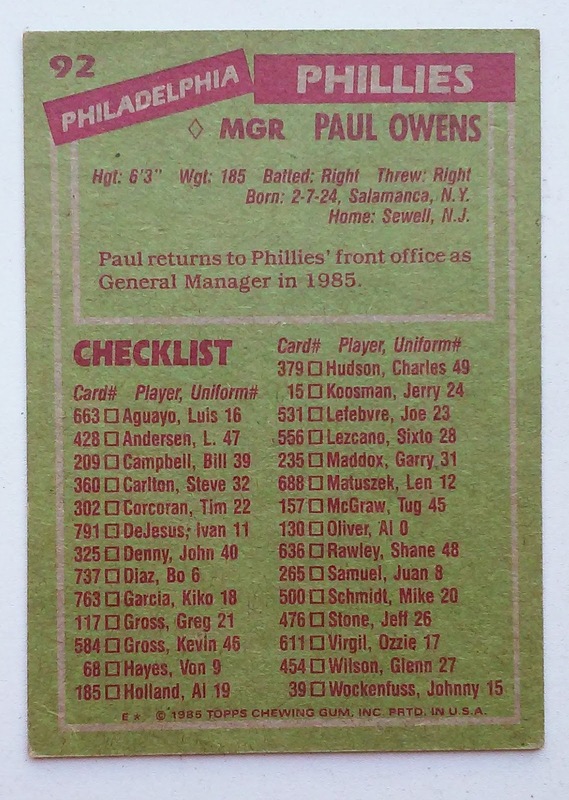 Two things of note on the back of the card 1) Text mentions Owens return to the GM role, 2) The 1984 Phillies fell from being an NL Pennant winner to being a .500 team. With the aging roster and general lack of young talent on that checker it is easy to understand the demise. 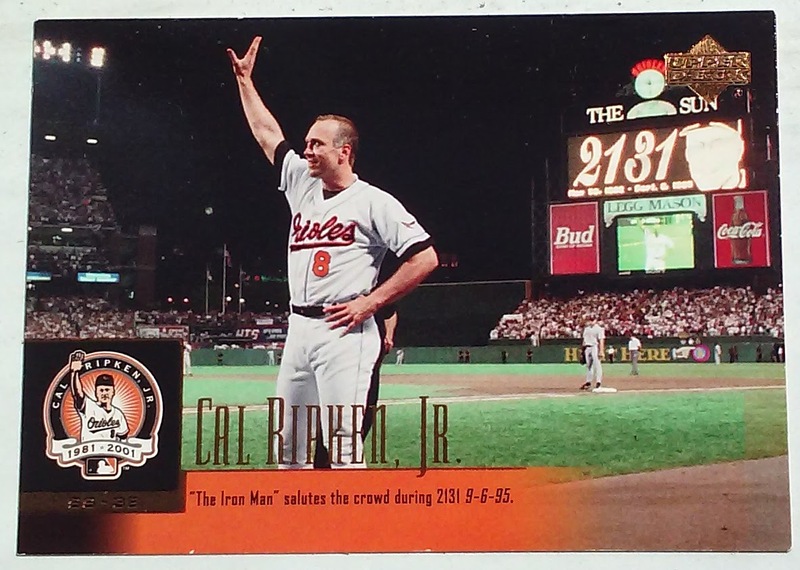 Last week when we published a posting on the Anniversary of Cal Ripken's streak breaking game I realized that I had yet to create an HoF Index for the Iron Man. Tonight with the Orioles hosting the Royals on Sunday Night Baseball we correct that oversight. 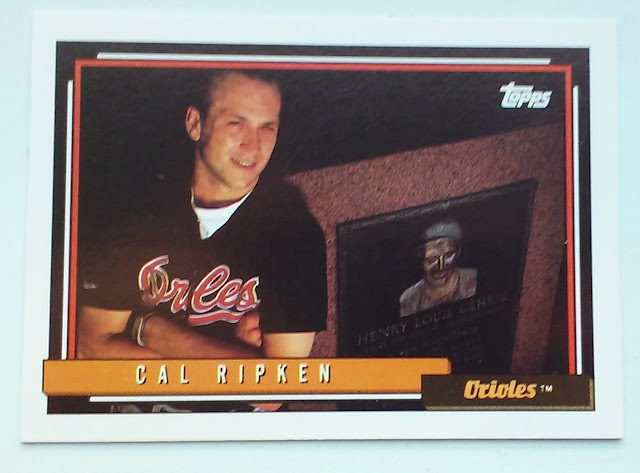 When Cal Ripken posed for the above shot he was likely still four years from passing Lou Gehrig for the consecutive games record. Apparently he had no fear of jinxing the streak by alluding to hit in the photo. There is nothing further I can add to that fitting description. 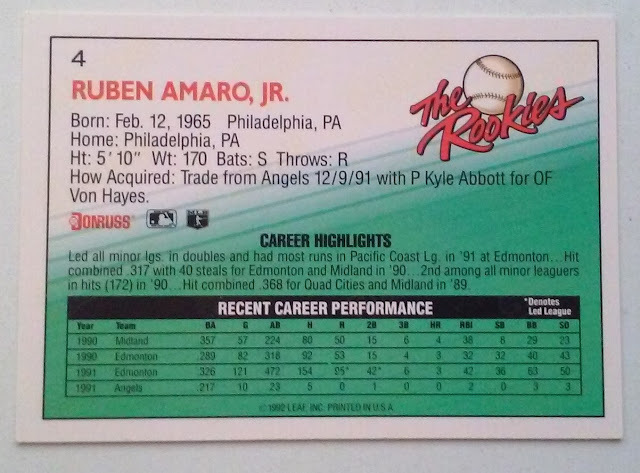 The card is a member of the ubiquitous 1992 set and can be found anywhere for nothing. I likely found mine in a dime box. 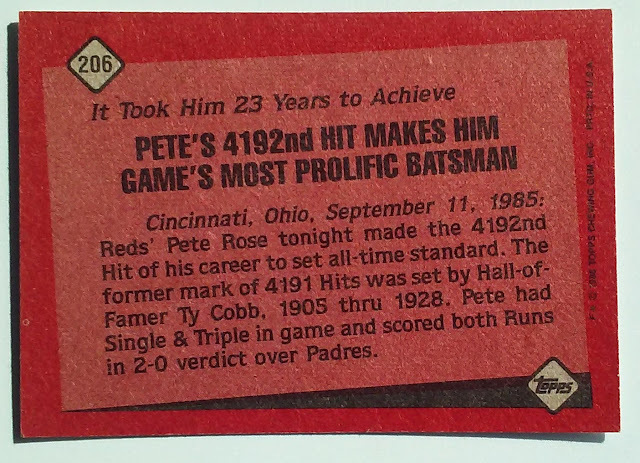 30 Years ago Pete Rose broke Ty Cobb's all-time hit Record. An accomplishment that would surely put Him in the Hall of Fame. Of course as we all know things change. Rose's record breaking hit was a first inning single off of Padres starter Eric Show in a Reds 2-0 victory over the Padres. 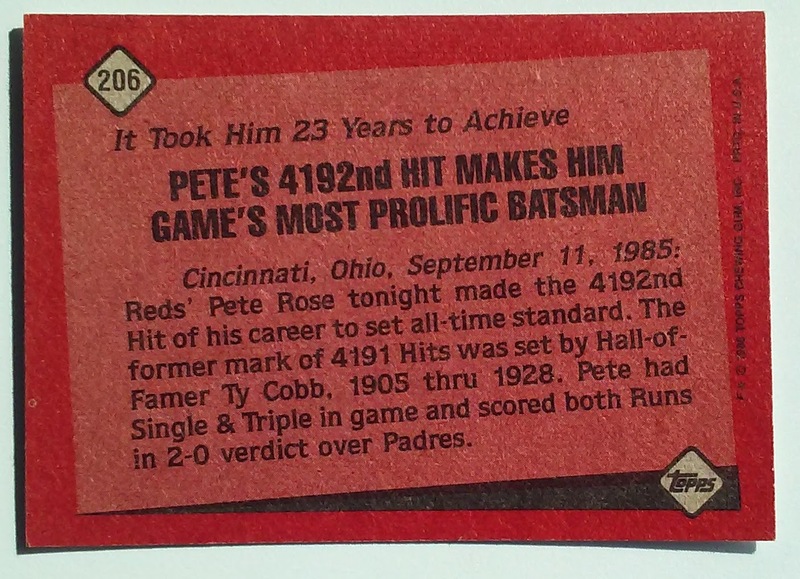 Nice Synopsis on the back of the card, much better than you would get today as Topps doesn't bother to recognize the existence of the Hit King. Today the Phillies made it official that Ruben Amaro would be let go as GM. Amaro's tenure as Philadelphia is looked upon rather poorly, he took over the Club shortly after they won the 2008 World Series and leaves them with the worst record in baseball. 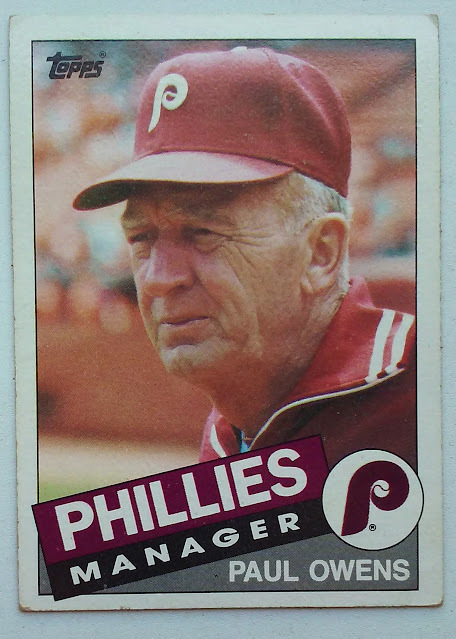 When evaluating RAJ time with the Phillies one must also consider the fact that he was one of the key people working with Pat Gillick to build the team that did win the World Championship. The Phillies have had declining fortunes for seven consecutive seasons, they are destined to finish with one of the three worst records in 2015 and have had 2 manager changes in the last 3 years. These are all factors that point to the need for a change. The demographics has the interesting factoid that Amaro was acquired as part of the meager return for longtime Phillie Von Hayes. 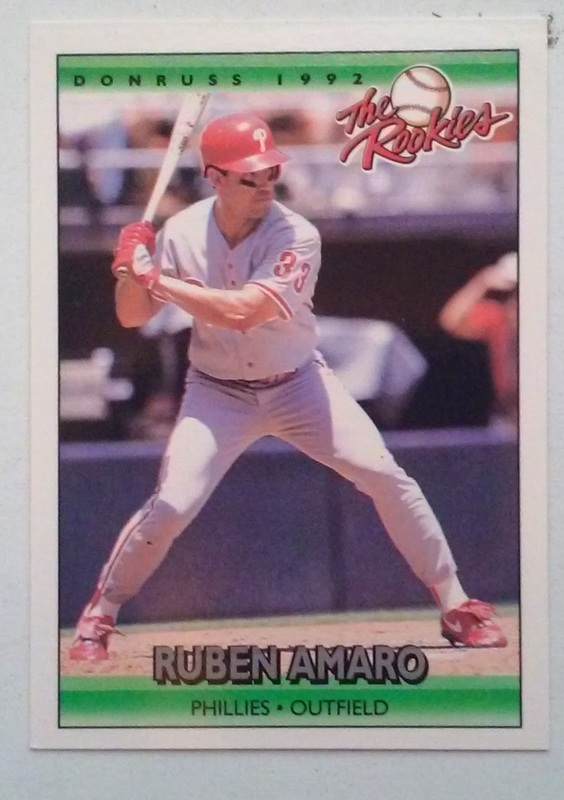 Despite this card being part of a set titled "the Rookies" it is not a Rookie Card. There are a few true RCs in the set, the Most prominent of which are Manny Ramirez (98) and Jeff Kent (61). 2008 World Series Champion and Current Phillies Broadcaster Matt Stairs has his RC at #112 in the set. Most of the season we have been looking back 25 years to the Year of the No-Hitter. Today we turn the clock back an additional quarter century and find ourselves on the day that Sandy Koufax became the first man to pitch four no-hitters. That fourth No-Hitter was also a Perfect Game. Love the Image on the card. 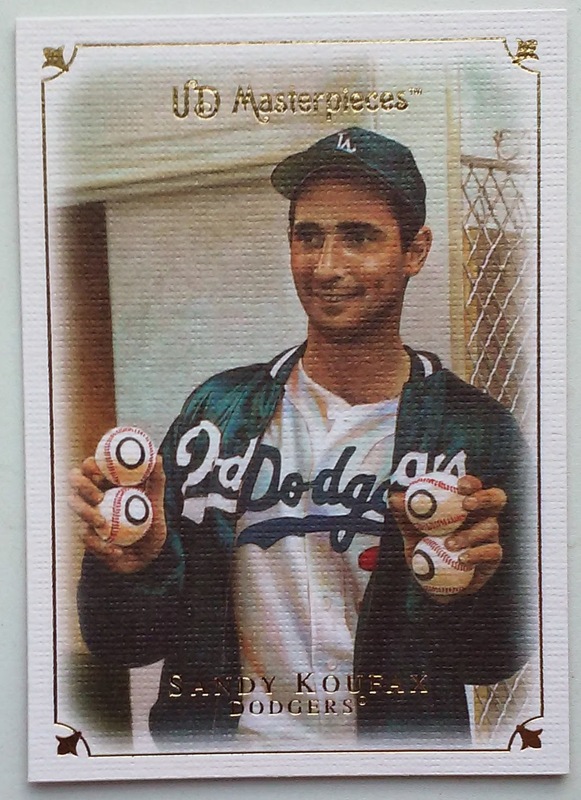 Four Baseball symbolizing the Four No-Hitters and The 29 year old Sandy Koufax with a reluctant smile that he can't hold back. Hard to believe 13 months later his career would be over. The text on the back of the card tells the story of the Perfect Game in which the Dodgers beat the Cubs by the narrowest of margins 1-0. The hard luck loser was journeyman pitcher Bob Hendley who pitched a 1-Hitter giving up only an unearned run. The Cubs lineup that day featured three future Hall of Famers, Ernie Banks (3 Strikeouts), Billy Williams (2 Ks), and Ron Santo (1 K). Of course on the other side of the ledger there were two Cubbies making their Major League Debut Don Young and future Phillie Bryon Browne. 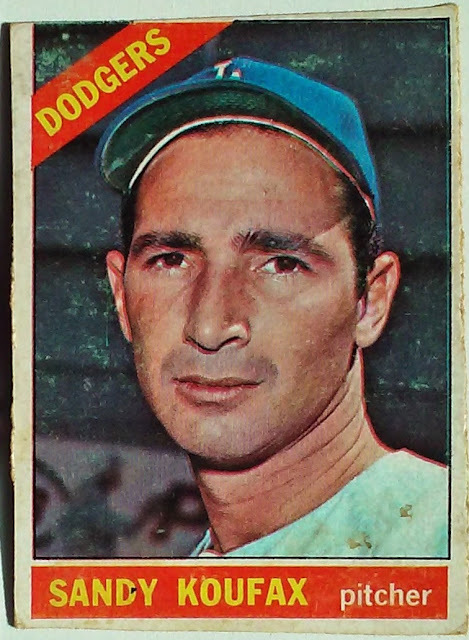 Notable Dodgers in the Lineup were Maury Williams, Willie Davis, Catcher Jeff Torborg (see below), and Lou Johnson who scored the Dodgers lone Run and got the games only hit. I re-read the chapter on Koufax's Game in James Buckley Jr's "Perfect". Couple of interesting things in the article. 1) The Cubs were in LA for one game only, Apparently this was part of the regular schedule NOT a rain out make-up. 2) The final out was a strikeout of Harvey Kuenn who was also the the last out in Koufax's 2nd No-Hitter. 3) The Cubs Bob Hendley pitched to two over the minimum for an 8-inning start, meaning only 53 batters came to the plate combined. The Lowest possible Combined PAs is 52, which has never been done. 4) The Perfect Game was the 2nd of three called by Hall of Fame broadcaster Vin Scully: Don Larsen, Koufax, and Denny Martinez. Both the Larsen and Martinez Perfectos were versus the Dodgers. Scully's call of the final 3 outs of the Perfect Game can be heard at Archive.org. If you stay with the recording to the end Vin Scully can be heard in an interview, he notes that he specified the time of day during this broadcast in an effort to add something special to the No-hitter since Sandy Koufax already had 3 recordings of the 9th innings of his no-hitters. 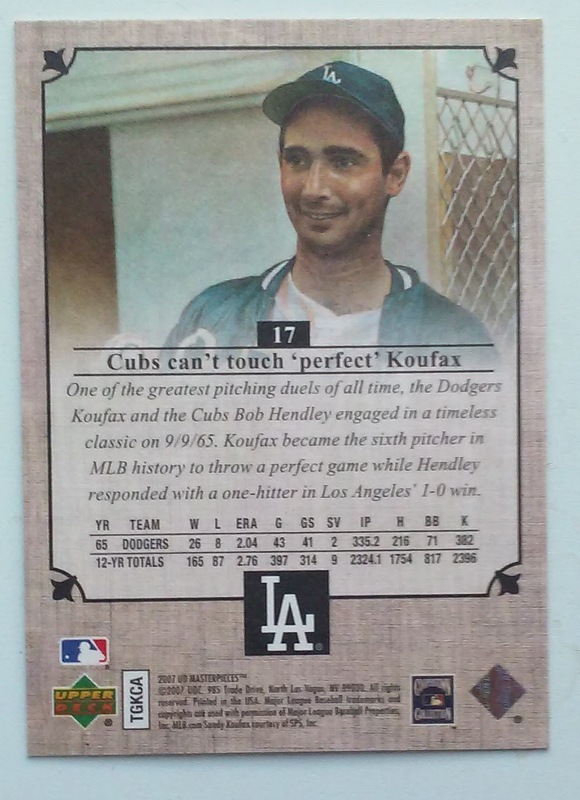 Going to put up this quick posting to use as our Sandy Koufax HoF Index. Hopefully fill in some details later in the season. How expensive is 2015 Topps? Tonight we take a look our second look at the price of Baseball Cards, specifically Topps Cards. We will take a look at the price of 2014 Topps versus some different Topps sets that have been produced over the lasr 40+ years. Column B is the Price of a Pack in the referenced year. Column C is the number of cards in that pack. In Column E I produce the cost for a 660 card set build from 12 card packs under perfect collation. I used 660 cards as a constant because it was the basic set size in 2012. Column F in red is the Inflation factor. This is the Key to the chart. 2012=$1. That dollar is worth 96 cents today, but in 1972 a single dollar had the buying power equivalent to $5.49 in 2012 dollars. Column I is similar to H but for the 660 card set. -To build a 660 card 2015 base set via Topps $1.99 12 card retail packs would cost 105.77 . -This Year there is 701 cards in the base set. Under perfect collation it would cost $116.25 to build that set. The cost would be 111.58 in 2012 Dollars. -While building a 660 card set would cost one about 3 times as much as it did in 1972, the price of building a set really hasn't changed since 1995. -I understand there are inserts and possible collation issues. I say trade your inserts for base cards. -The cost of 660 cards is slightly cheaper each of the last 2 years because Topps has maintained the pack size and price point while inflation has been slight. 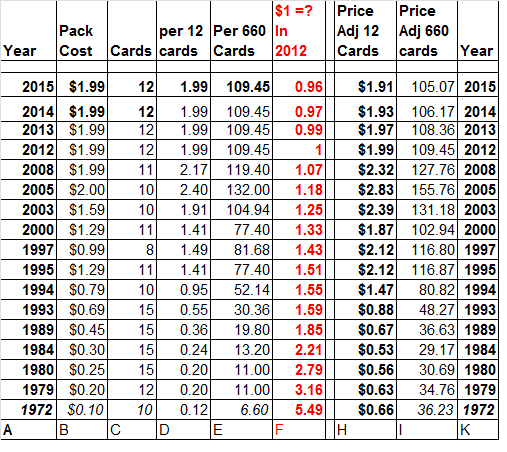 -Cards are cheaper then a decade ago by over 30%!! -Despite Topps obtaining a monopoly on the MLB license prices have dropped 16% since 2008. This is a difference of over $20 when building a 660 card set. Sunday Night Baseball is in St Louis to catch the Cardinals hosting the division rival Pittsburgh Pirates. The Cardinals have a great next man up program, It seems like every time they call up a minor leaguer they are ready and it is often somebody that I hadn't heard of. 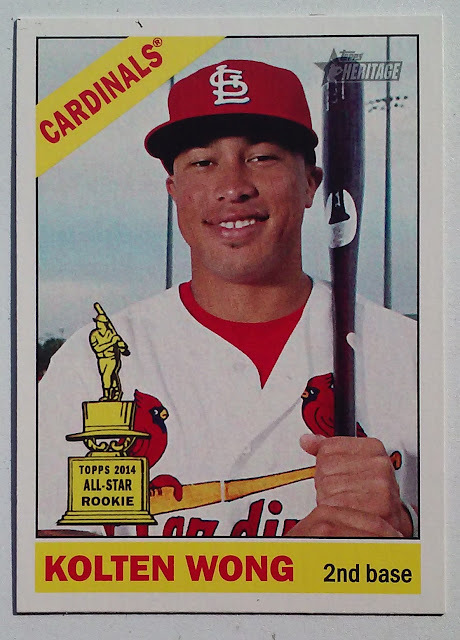 Kolten Wong was a bit more known than most of the Cardinals prospects, I had heard of him since at least 2013 when he appeared in the futures game at Citifield. He may not be All-Star material yet, but Wong has been a productive player at a keystone position and at 24 has plenty of baseball in front of him. Last year He finished 3rd in the Rookie of the Year voting behind Jacob DeGrom (who he may face in the 2015 playoffs) and Speedster Billy Hamilton. 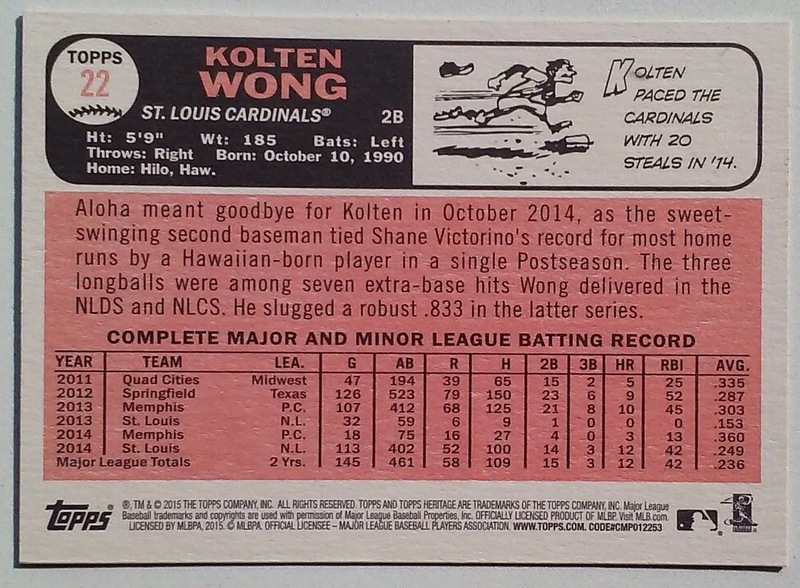 Nice to see Shane Victorino get repped on the b-side of Kolten Wong's card. 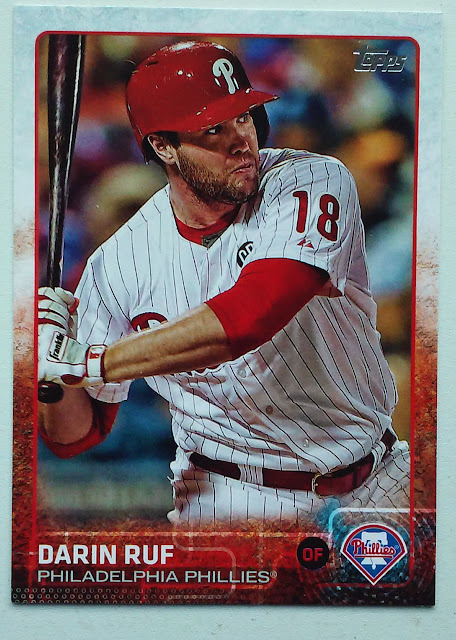 Shane hit his 3 homers during the Phillies 2009 NL Championship campaign. Not sure how Kolten Wong ended up on Card 22 in Heritage. The Original Slot was held down by back up outfielder Joe Nossek. The Cardinals Mid-1960s second baseman was Julian Javier - he lived at #436 in the 1966T set, a spot that Topps awarded to Justin Upton (as a Brave) in 2015. My other thought was that Topps could have put Kolten Wong on card #195 which was occupied by the Rookie Cup second baseman in the 1966 set, Joe Morgan. Alternatively Topps could have matched that Iconic card with the Astros current stand out Jose Altuve - Of Course they did not - somehow Edinson Volquez got the nod. 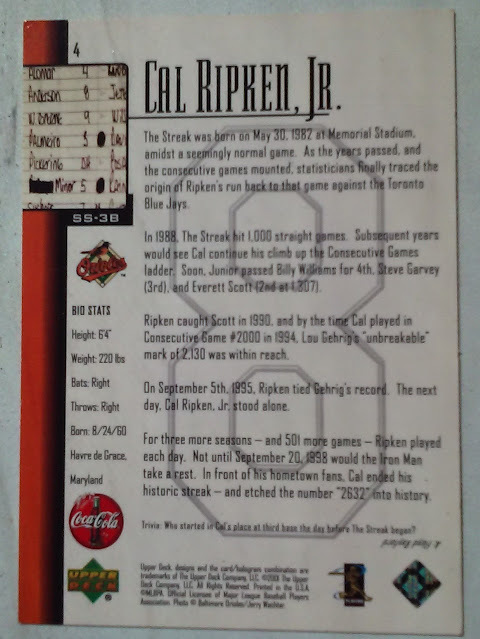 Quick Post to recognize the 20th Anniversary of Cal Ripken playing in his 2131st consecutive game, breaking the record previously held by Lou Gehrig. This card is from a special 2001 Commemorative set that I believe was a giveaway at an Orioles game - wish I can remember. The flip side of the card covers some of the milestones in the streak and has a thumbnail of the lineup card from the game Ryan Minor started in place of Ripken. We discussed that game where Cal Ripken finally took a day off on the 15th Anniversary. 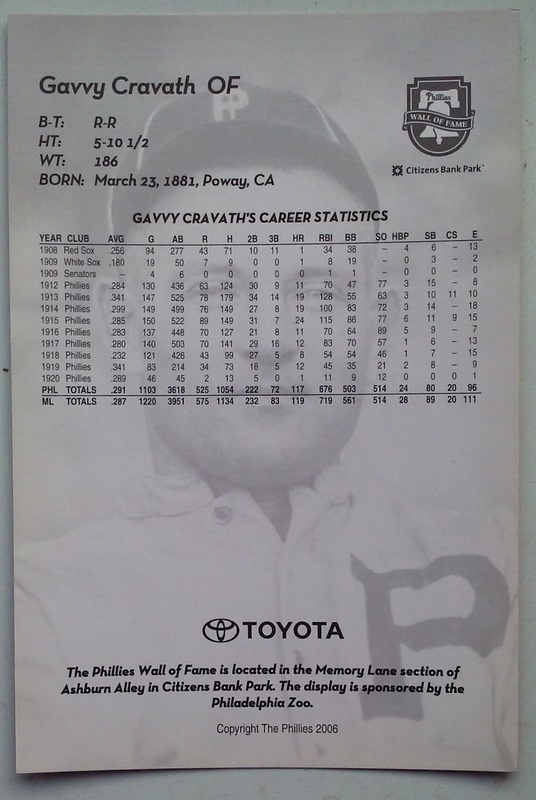 The Offensive Leader of the 1915 Phillies was Clifford Carlton "Gavvy" Cravath. The then 34 year old Right Fielder led the NL in Home Runs, RBIs, Runs Scored, Total Bases, OBP and Slugging. His 24 Homers sound modest by today's standards, but at the time it was the highest total in either league during the first 18 years of the 20th Century - more on this later. If SABRmetics had been around a hundred years ago it would also have been mentioned that Gavvy Cravath led the NL in WAR at 7.0 or 6.4 oWAR for those of us who are skeptical about defensive metrics. Had their been an MVP award at the time I am pretty sure that Cravath would have won it. Unfortunately Gavvy's great regular season didn't continue into the World Series. He only picked up 2 hits in 16 At-Bats. 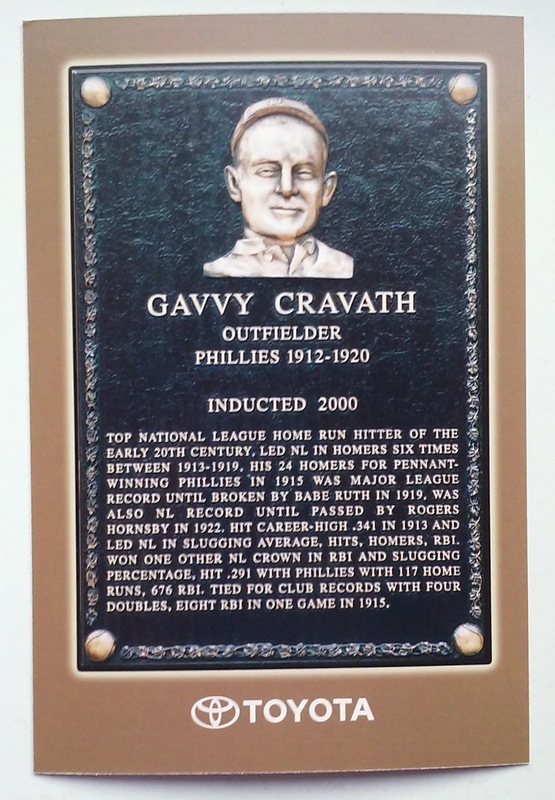 Cravath did get the Go-Ahead RBI in the 8th inning of game 1 on a ground out to Shortstop - it was the only game the Phillies would win in the Series. The Victory would remain the Phillies lone World Series game W until Game 1 of 1980. I am pretty sure this post card set was a giveaway item for the Phillies in the early days of Citizen's Bank Park. We are almost a decade beyond the original issue and these are probably in need of an update. 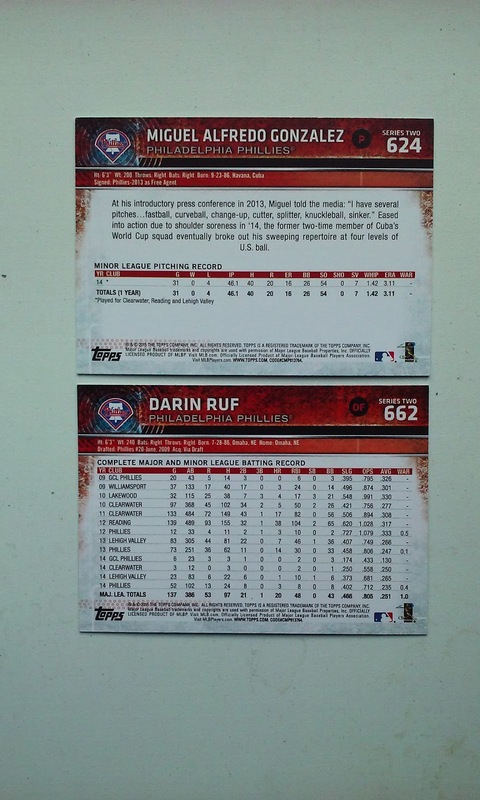 The back of the cards include brief demographics and lifetime stats atop a profile photo. 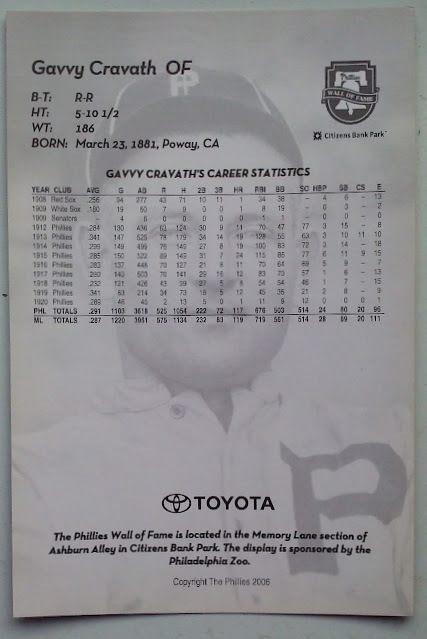 Gavvy Cravath's stats include a few brief stints with various clubs prior to joining the Phillies for the bulk of his career. Above we spoke of Cravath's 24 homer season in 1915. It was one of SIX TIMES that he would lead the NL in Home Runs. When he retired in 1920 Cravath was the Active Leader in Home Runs with 119 which was 19 behind the All Time Leader Roger Connor. A Year later Babe Ruth would eclipse both Connor and Cravath. On September 2nd of 1990 Dave Stieb’s quest for a no-hitter finally ended. Stieb and his Blue Jays teammates defeated the Cleveland Indians 3-0. 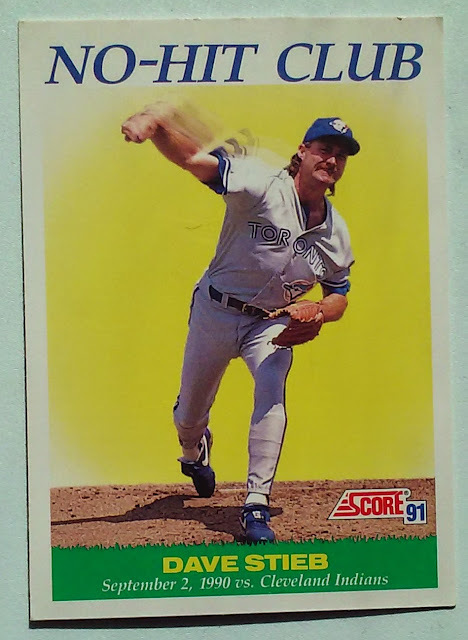 Stieb Struck out 9 while issuing 4 bases on balls. However he pitched to 2 over the minimum thanks to his batterymate Pat Borders throwing out a a pair of runners on attempted steals. 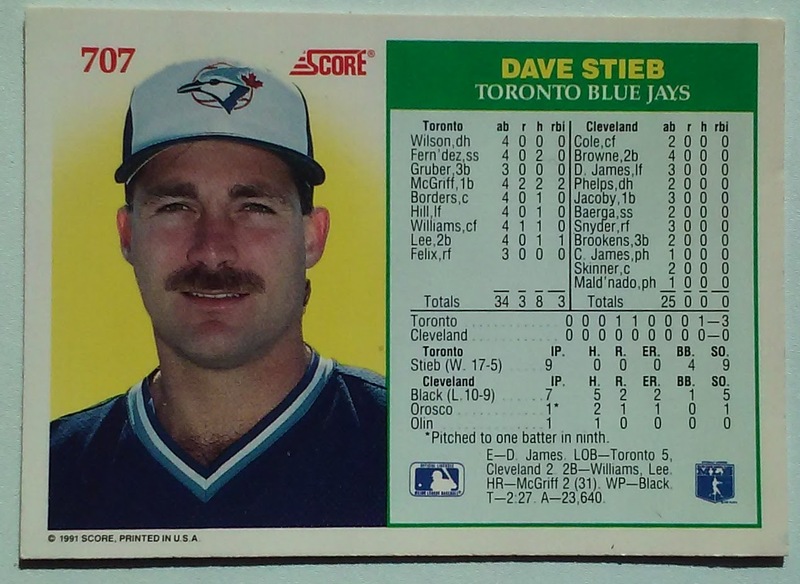 Not a lot of big names in the unit that Dave Stieb recorded his milestone game against. Two parts of the Indians lineup versus Stieb arrived from San Diego in a Trade for Joe Carter (Boo!) Carlos Baerga and Chris James. The Padres originally received James in a trade that sent John Kruk to the Phillies. Seifeld favorite Ken Phelps makes his 3rd appearance in our Year of the No-Hitter Series. He busted up Brian Holman's perfect game on April 20th and was struck out in a pinch hitting appearance versus Nolan Ryan on June 11th. Phelps went 0 for 2 versus Stieb but did reach base via one of the four walks. Notice above I state Stieb’s quest “Finally Ended” well I have no real way of knowing if this was really a quest for the Blue Jays Ace. But I do know that he came awful close to tossing no-hitters several times. Dave Stieb’s autobiography titled “Tomorrow I’ll be Perfect” was released in 1986, two years prior to his No-Hitter string. The reference to Tossing a Perfect Game, which never happened but hopefully the No-Hitter he got on September 2 1990 was close enough. The SABR Games summary of this game was authored by Adrian Fung and can be found here.